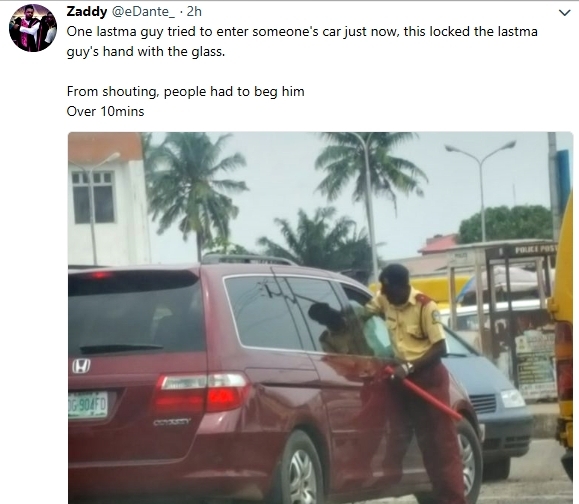 A Twitter user identified simply as Zaddy (@eDante_), has taken to the social networking platform to share a photo and reveal how LASTMA officer in Lagos begged for mercy after his hand was trapped by a driver who wound up as he tried to forcefully enter the car. 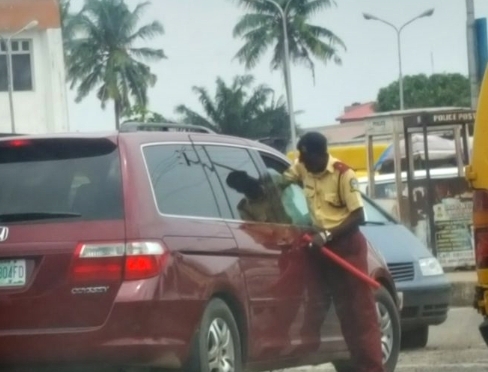 The officer of the Lagos State Transport Management Authority (LASTMA), was seen in the viral photo begging for mercy after the driver wound up his window, trapping his hand as the officer tried to forcefully gain entrance into the vehicle. He wrote: "One lastma guy tried to enter someone's car just now, this locked the lastma guy's hand with the glass. From shouting, people had to beg him Over 10mins."